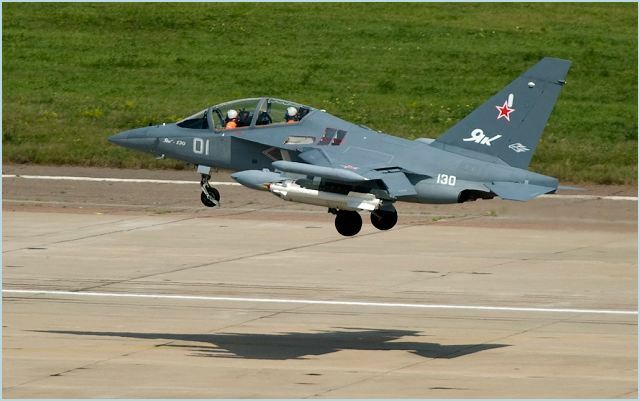 Algeria Air Force will be equipped with Russian made training aircraft Yak-130 for end 2011. Up to the end of 2011 the Algerian Air Force will get from Russia a batch of Yak-130 trainer-combat aircraft. Since April 2011 these planes had been used by the Russian Air Force for training future pilots of combat aviation. The pilots, who at the moment undertake an active phase of flying program, speak in favor of high maneuverability, stability and controllability of the aircraft. Algeria has ordered these state-of-the-art trainer-combat planes in order to have a high-quality training of Su-30MKI(A)’s pilots. Both planes are manufactured at production facilities of IRKUT Corp. Algerian pilots have already completed their training in Russia and nowadays make preparations for getting new aircraft at home. This way Russia has taken the lead over its main competitors on a wide market of subsonic jet trainer-combat aircraft for advanced training. An expected growth of the market is reasoned by the fact that the trainers of previous generation (like the British Hawk) in their characteristics lag behind considerably after fighters of «4+» and «5» generations. Consumers expect from trainer-combat aircraft of new generation a higher maneuverability and thrust-to-weight ratio, capability of flight at high angle of attack, IT software of the pilot’s cockpit. The Yak-`130’s real competitor in the niche of subsonic trainer was developed on the base of the Yak-AEM-346 technology demonstrator, which was worked out in mid 90s by Yakovlev DB (nowadays it is called “Yakovlev Engineering Center” of IRKUT Corp.) with the participation of Italian specialists. Experts believe that this competitor is characterized by a bigger price, more moderate combat characteristics and includes a considerable part of US-made components in its construction.